The dinosaurs that escaped extinction | Where's my backpack? If you’re ever in Seattle’s Fremont neighbourhood, keep your eyes peeled for two dinosaurs who cheated death and went on to live long, happy lives along the banks of the ship canal. The mother and baby dinosaurs were part of an exhibit at Seattle’s Pacific Science Center in the 1980’s but when the exhibit came to an end, the dinos were scheduled for destruction. Luckily for dino lovers everywhere, a group of Fremont locals got together and purchased the exhibit for the grand total of $1 and orchestrated the difficult task of transporting the 66 foot long steel frames, weighing 5 tonnes, to their new habitat. 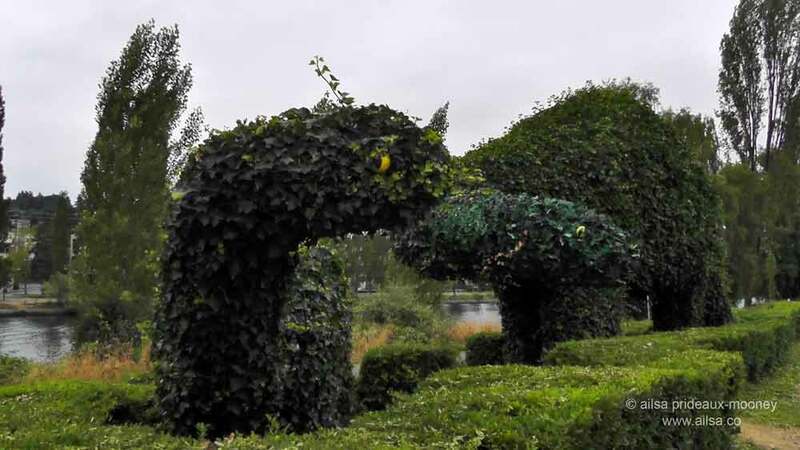 Once the frames were in place, thousands of ivy plants were brought in and lovingly tended to over the years until the frames were completely covered and the dinos roamed free once again. The mother apatosaurus and her baby can be found lolling along the Burke-Gilman Trail at the corner of N. 34th and Phinney. Some of you might recognize the shape as being that of a brontosaurus and you would be correct. In 1877, a Professor of Paleontology at Yale by the name of Othniel Charles Marsh recorded a juvenile, incomplete skeleton, naming it Apatosaurus, which translates as deceptive lizard. Two years later, he recorded another skeleton, but because it was so much larger, he thought it was another species which he dubbed Brontosaurus, or thunder lizard. It wasn’t until 1903 that the mistake was uncovered, so technically, the brontosaurus never really existed. 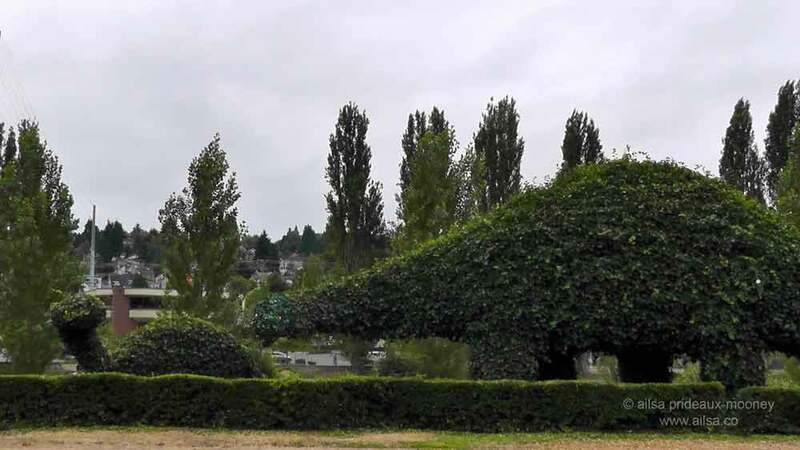 But on the banks of the ship canal in Fremont, the topiary dinos don’t care what they’re called. They’re just happy to have escaped extinction. This entry was posted in Photography, Travel, United States, Washington and tagged art, inspiration, nature, photography, photos, travel, writing. Bookmark the permalink. so here is where Nessie is hiding !!! she’s supposed to be in Scotland ! Somebody had a lot of fun to make their vision come true!